Baked beans are one of those things that seem pretty darned perfect right from the can with that long honored secret recipe locked away from us forever. So, when I set out to make my own batch of baked beans, Handsome asked why bother? One, I wanted too, two I wanted to see if a few hours of slow cooking and the geniuses over at Cook’s Illustrated could convince me that going back to a can was never going to happen again. It didn’t. But that’s not to say these beans weren’t kicking, but when a good can of beans is at most $2, you really can’t beat it. The pro’s? This recipe can stand to be tweaked a lot. There’s a lot that could be done to really customize some flavors. Also, you know everything you put in it. Knowing what’s in your food goes a long way. So when I need something more then a weeknight quick fix side dish, these beans are totally worth the 11 hour wait. Microwave onion, garlic, and oil in bowl, stirring occasionally, until onion is softened, about 5 minutes. Transfer to slow cooker. Stir water, beans, 1/2 cup barbecue sauce, coffee, sugar, and bacon slices into slow cooker. Cover and cook until beans are tender, 9-11 hours on low, or 5-7 on high. Discard bacon slices. Stir in remaining 2 tbs barbecue sauce and mustard and let sit until thickened slightly, about 10 minutes. Season with salt, pepper, and hot sauce to taste and serve. This dish can be held on warm setting for 1 to 3 hours before serving. Loosen with additional hot was as needed before serving. Makes me think summer is almost over!! 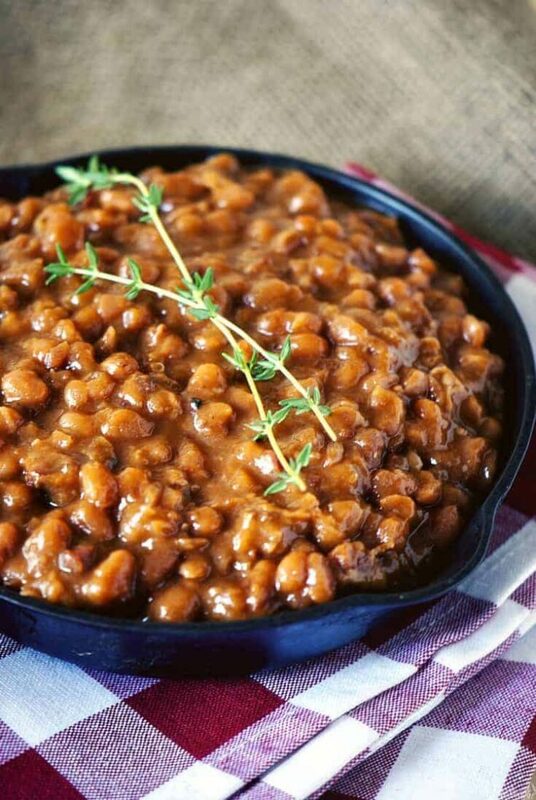 I’m always lookIng for a great new way to cook beans- this looks delicious! 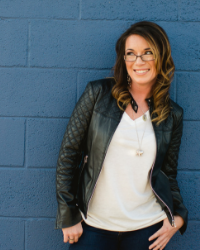 Woman, you never disappoint…every time I visit you, I end up drooling all over my keyboard… pass me those beans, please! Beans are a staple with my family in the summer time. 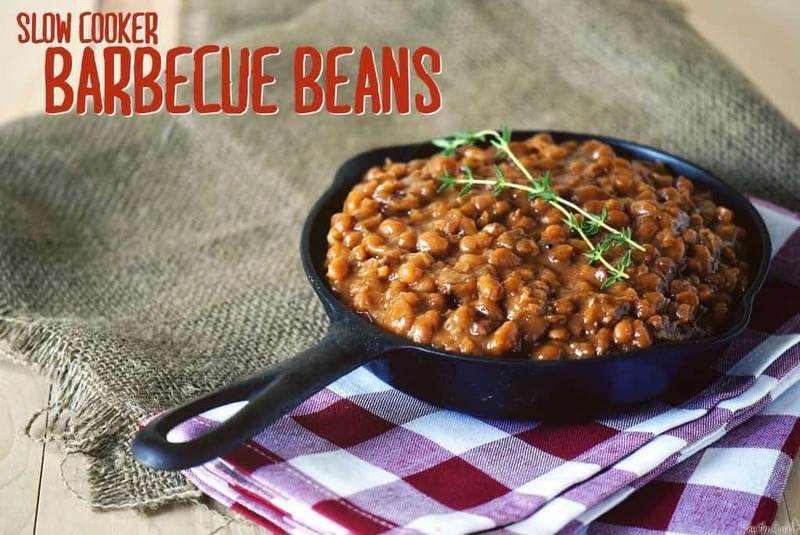 You won’t see a barbeque or hardly a meal ever without the baked beans. Looks great! Of course you can. I am not a fan of coffee myself. You can substitute a bit more water or barbecue sauce in it’s place. Normally, I would agree with you. Why waste good bacon? But, going from uncooked to 11 hours in a slow cooker results in a pretty gross and stringy texture. If you would like, I would discard the bacon at the end, and add freshly cooked crisp bacon back to the slow cooker just before serving. Try cutting the bacon into 1″ pieces, then fry to crispy. Add bacon and it’s grease to the beans. Perfect! Mmmm….those would have gone so well with my grilled chicken with white bbq suace last night. never made beans from scratch before, I usually just doctor up the canned beans a bit. Looks tasty. Thanks for sharing. I love those canned beans too. I would an entire can for dinner if I could. These look delicious too! Love the coffee in them! No. Normally that step is very important, but the elves over at Cook’s Illustrated said to just rinse and pick over for any small stones before dumping them into the crock pot. I didn’t soak mine over night. In a previous attempt with a similar recipe from another source, I did soak the beans, but things never came out quite right. 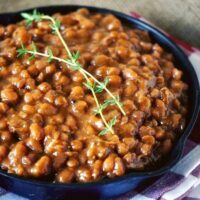 I have been wanting a great recipe for homemade baked beans. I’m going to pin this to try later. My husband hates coffee with a passion, but I’m going to put it in and see if he tastes it. 😉 Thanks! I have to admit, I buy canned too – they are so easy and inexpensive!